Prospective members of the All Army Women’s Bowling team huddle following a practice session April 12 at Fort Lee’s TenStrike Bowling Center. 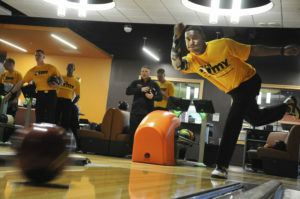 The All Army Bowling Trials Camp got underway April 11. Out of the 16 Soldier-competitors, four males and four females have qualified to represent the Army team during the Armed Forces Championship April 13-15. Sgt. Gavin E. Wainright Jr., from Fort Hood, Texas, launches the ball toward the pins during the All Army Bowling Trials Camp at Fort Lee’s TenStrike Bowling Center April 11. He is one of 11 male bowlers vying for four spots on the Army team that will compete against the Navy and Air Force in the Armed Forces Championship set for April 13-15 at the same location. FORT LEE, Va. (April 13, 2018) – The All Army Bowling Trials Camp got underway Wednesday at the TenStrike Bowling Center here. Out of the 21 Soldier-competitors, four males and four females have qualified to represent the Army team during the Armed Forces Championship today-Sunday. The Navy and Air Force men’s and women’s trial camps are being held concurrently at the Army’s newest bowling facility. Staff Sgt. Rose Aguilar, a six-time Army team member, said the tryouts and tournament are always competitive, but this year’s event has been quite a challenge. Scott Lentsch, the Army coach, said tournament conditions require critical thinking and strategy. He was busy Thursday morning advising bowlers how to adjust to tournament-condition lanes, which are oiled substantially more than normal and play a lot slicker. He said it is difficult to figure out what works if bowlers lack experience. “That’s where I come in – to offer them advice on how to play the lane correctly, including how to re-surface the ball and how to pick up spares differently,” he said. During the trials, competitors are afforded one day of practice, then must complete 12 games the following day for qualification scores. The four top rollers earn spots on the team. Lentsch said the schedule requires a lot of stamina. The biggest upside regardless of whether the Soldiers make the final team or not, Lentsch said, is the opportunity for these high-performing athletes to improve their game. Following selections, which should have been completed Thursday evening, the Army bowlers will try their hands at supplanting the Navy men and Air Force women, defending champions from the 2017 meet. For updates on the final rounds of the bowling competition, visit www.facebook.com/ArmedForcesSports.